Mark Antony and Cleopatra — one of history’s most famous romantic couples — were not the beauties immortalized in prose and portrayed in film, according to a 2,000-year-old coin bearing their likenesses. 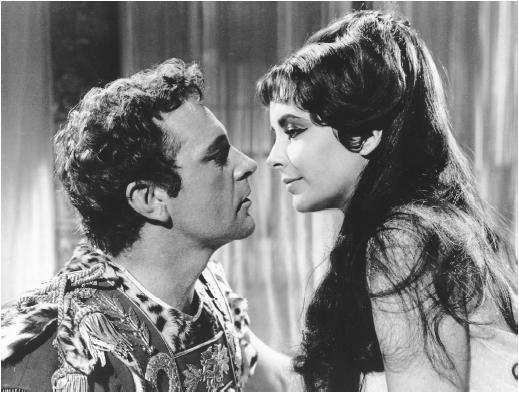 Academics at Britain’s Newcastle University studying the Roman denarius coin say the Roman politician and Egyptian queen bore little resemblance to Richard Burton and Elizabeth Taylor, the actors who portrayed them in the 1963 film Cleopatra. “The image on the coin is far from being that of Elizabeth Taylor and Richard Burton,” said Lindsay Allason-Jones, director of archeological museums at the university, recalling the film that ignited the tempestuous romance between the two stars. It’s not the first time images of Cleopatra have turned up showing a less-than-flattering version of the famous Egyptian queen. But the public perception of her as a physically attractive woman has in part endured because of her legendary charisma. Allason-Jones concurs, saying the image of Cleopatra as a seductress is a more recent image. “Roman writers tell us that Cleopatra was intelligent and charismatic, and that she had a seductive voice but, tellingly, they do not mention her beauty,” she told the BBC. The coin from 32 BC would have been issued by the mint of Mark Antony. It went public on display Wednesday at the university’s Shefton Museum. And ideas on it vary throughout history. Also, the extent of accuracy of the coins as portraits is a point here. How the Battle of Actium Changed the World: here. This entry was posted in Film, Politics, Visual arts and tagged Cleopatra, Egypt, Egyptology, history by petrel41. Bookmark the permalink. Age cannot wither her, nor custom stale her infinite variety; other women cloy the appetites they feed, but she makes hungry where most she satisfies. So maybe Mark Antony loved Cleopatra for her mind. That is the conclusion being drawn by academics at Britain’s University of Newcastle from a Roman denarius coin which depicts the celebrated queen of Egypt as a sharp-nosed, thin-lipped woman with a protruding chin. In short, a fair match for the hook-nosed, thick-necked Mark Antony on the other side of the coin, which went on public display Wednesday at the university’s Shefton Museum. ‘The image on the coin is far from being that of Elizabeth Taylor and Richard Burton,’ said Lindsay Allason-Jones, director of archaeological museums at the university, recalling the 1963 film ‘Cleopatra’, which ignited the tempestuous romance between the two stars. The notion that Cleopatra was not in Taylor’s league was hailed as a revelation in British newspapers on Valentine’s Day, though the image is hardly a discovery. Replicas of the denarius can be found on eBay, and images on other ancient coins are no more flattering. Cleopatra’s legend has grown over the centuries. Copyright 2007 The Associated Press. All rights reserved. Valentine’s day reassessment from archaeologists.